I am a lot of things. I am a daughter, a sister, a girlfriend. I am a feminist, an equalist, an animal lover. I am a writer, a psychology graduate, an avid cook. I am a pessimist, a joker, an adventurer. I am a PTSD sufferer. Of all these things, it sometimes seems as if society sees me as only one thing: someone with mental health difficulties. And very often the stigma and preconceptions have been more limiting than the illness itself. You don’t need to know why I have post traumatic stress disorder. It is the first thing that everybody asks. But you need to understand that, for people suffering from it, revealing our reasons can lead to people to view us in ways we do not want – or deserve. I am not a victim. I am not weak. I am not a liar, or an attention-seeker. Nor can I just get over it, move on, deal with it. I wish I could. But it’s not that simple. So I have been having anxiety attacks for twelve years. They started when I was fourteen. I don’t have the attacks all the time. In fact, some years I have only two or three.The problem is that I have also had periods of debilitating anxiety that have lasted months. School, work, housing are all affected. Anxiety rips through my life like a wildfire and destroys everything. As a result, when I manage to somehow pull myself out of it, I am left living back with my family – without a job, having to pick up everything and to try this whole business of being an independent adult again. Feeling like a failure. Last year, I had one of these bad times. But I also had a breakthrough. I went to a psychiatrist, and although I have seen many before, this one asked the right questions and realized something: I have post-traumatic stress disorder. And probably I’ve had it for twelve years. That’s my entire teenage and adult life. Perhaps you wonder how somebody could live so long with an illness like this, and not be diagnosed. That’s a bit complicated. Firstly, post-traumatic stress disorder is largely understood to affect war veterans, people who have been in accidents, or just targets of violent crime. (Notice I never use the word victim: it’s a very unhelpful way to think of oneself.) However, I had kept my traumas secret for years. Secondly, it’s to do with how people perceive the nature of the disorder. In films, a character ‘zones out’ and a big action scene starts – gunfire, explosions, etc. In fact, flashbacks don’t have to include all the senses; neither do they have to last minutes, or result in the sufferer not knowing what they are doing or where they are. I don’t know if other people have flashbacks like that – I imagine that for some people it may be close to the truth, but probably not for the majority. For me, the flashbacks are very similar to anxiety attacks, except they only happen when something reminds me of an incident from the past. They start with a quick flash of an image, a smell, or a sound. Sometimes, I feel pain from old injuries, but fresh and new, as if it’s only just happened. This lasts a few seconds. Then every muscle in my body tenses. I feel like I can’t breathe. At this point, I usually go to a quiet spot to calm myself down by using ‘grounding’ exercises. But if I cannot leave the situation, I start to hyperventilate. My legs cramp up. I get dizzy. I sit down and curl myself into a ball. I am unable to talk. I cry. This all lasts as long as it takes. These, I was always told, were anxiety attacks. Nobody figured out they were flashbacks, because they didn’t ask what was happening in my mind – what triggered them. Nothing too dramatic. No explosions. Just a girl sobbing in a bathroom. If I am allowed the space to calm myself down, then after ten to fifteen minutes, I’m able to go on with my day as usual – just a little tired and needing space. People on the outside also believe that someone with PTSD is somehow dangerous. Of course, we may all have seen news reports about this, but for the most part anyone with PTSD ends up exerting great self-control for fear that their disorder will affect those around them. It is hard to relax when you’re scared that you might hurt somebody, overreact to something, frighten somebody. 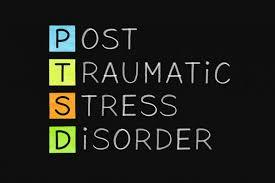 If PTSD sufferers are involved in violent incidents, it is usually around alcohol or drugs. It’s unfortunate that people do not get the help they need, and may turn to substance abuse to relieve the pain. Because I was not diagnosed for many years, I have had lots of jobs I probably would not have been able to do with the stigma of a PTSD diagnosis. I have worked with non-verbal adults who had brain injuries, as a nanny for infants and small children with epilepsy, and in an HIV clinic. I loved all those jobs, and although each was sometimes very stressful, I never once raised my voice or lost my temper. I know when I am at my limit, and I know to walk away for a few minutes to calm down. I hate the fact that some people would judge me unsuitable for those jobs now I am diagnosed with PTSD, or they think I’m somehow dangerous, when I have lived with this for a long time and it has never led to me hurting anybody. Yes, I have had PTSD for twelve years. I have worked with children and vulnerable adults. I got a degree, developed friendships – and relationships. I have lived in three countries, and travelled through countless others. I have talked openly about my experiences. I have read my stories and poems out to rooms full of people. I have lived a life that, although unsteady at times, has not been limited and has been filled with moments of pure joy. Many people would see a PTSD diagnosis as something terrible, but after years of suffering, it was something positive. After all these years, there is a chance of recovery through EMDR therapy. * And although therapy has been really tough, it has worked, and I find myself vastly improved. I have disarmed a lot of situations that would have previously given me a flashback. I have cured phobias. And I no longer feel that I have to avoid certain situations. I am more at ease in social groups. I do not jump when touched. I have been able to develop a loving relationship, and now I trust my partner in ways that were not previously possible. Though I have done many amazing things, until I started to get better I never knew how restricted I was by this illness. I learnt to trust my friends more, and to reach out to people when I was going through hard times. I was surprised to find that people were supportive. They weren’t judgemental or pushy. They did not need every detail explained to them. They just let me know that they were there if I needed them, and forgave me when I needed to draw back from them for a while. My partner’s reaction when I told him was to say that it doesn’t change anything. Then he started singing ‘Fixer Upper’ from Frozen – one of my favourite movies. I know that I now have the tools to deal with my PTSD if it comes back again. I know the people I can turn to. I know what exercises and activities will help keep me healthy, both physically and mentally. I know how and when to give myself time with friends, and when to spend time alone. I can figure out when to take time to work and time to relax. And I can make time to be creative or active. I know what situations I can cope with, what situations I need to work on, and when to ask for help. Though I will always have this illness on some level, I know that I am getting better, and that I have a whole life ahead of me to enjoy my new-found freedom. I am sending this out as an open letter to anybody who cares to read it – with a simple message. I have PTSD. It’s an illness. It doesn’t define who I am. I am neither victim nor survivor. I am just a person, like any other. My illness does not make me weaker, or stronger. I strive everyday to be healthier, happier and more fulfilled, not because I have PTSD but because everyone should strive for these things. *EMDR therapy: Eye movement desensitization and reprocessing is a set of standardized protocols incorporating elements from many different treatment approaches. Devised by Francine Shapiro in 1987, it is to help people process traumatic memories, and is gaining in popularity, especially for PTSD.